The Lost Palms Oasis in Joshua Tree National Park, California. 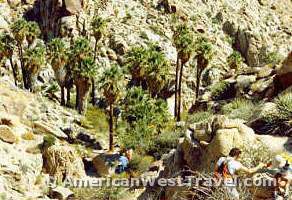 A rare natural oasis, it is hidden in a steep desert canyon reached by a four mile trail which winds through a very scenic desert foothills region. Although the upper palms (top right in picture) may be glimpsed before this point, you cannot see the canyon itself until you reach this overlook. It is indeed a pleasant surprise after walking across the desert. 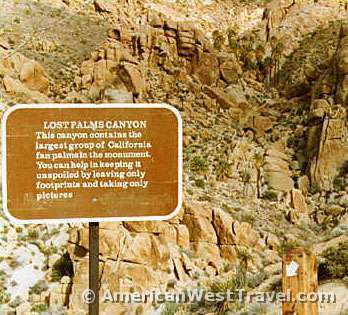 The main palm grove is a short distance down the trail from the overlook and continues down the canyon for about 1/4 mile. The Lost Palms truly lives up to one's imagination of a desert oasis: running water, lots of shade, soft sandy spots to rest on under the trees, and breezes wafting through the palm leaves. The sky is almost always a deep clear blue. A great place for lunch! (Left), A small group of palms highlighted against the steep walls of the canyon. 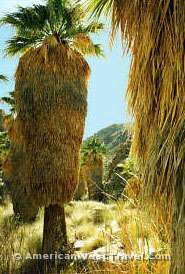 (Right), A group of palms with their "dresses" intact. The trees retain their decor until a lightning-induced fire burns them off. The trail from the Cottonwood Springs parking lot crosses a rugged desert foothill region consisting of hills, cliffs, canyons, and many scenic views. Joshua Tree National Park contains a transition zone from the Sonoran Desert in the south to the Mojave Desert in the north. Driving along the main park road, you will see a startling change in desert landscapes. The trail is in the southern end of the park and crosses what is known as the Colorado Branch of the Sonoran Desert. The Colorado Branch is the area west of the Colorado River. It differs from the main Sonoran Desert in Arizona in that having very little summer rains, there are no large cacti such as the Saguaro. First complete guide to cover the entire park region, from the habitats and lifestyles of wildlife in the area to backpacking trips, short day walks and full-length hikes. Illustrated with original topographic maps, this book will guide you to Death Valley's most popular sites and many spectacular, out-of-the-way places, illustrating the remarkable diversity of its terrain, geology, flora, and fauna. The Mojave Desert covers most of southeastern California and Nevada. It is one of the world's most arid and warmest places, with Death Valley offering the extremes of both. The desert mountain ranges in the rain shadow of the Sierra Nevada provide stark and beautiful scenery. 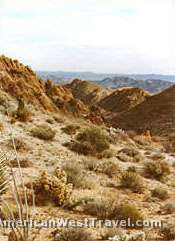 The Mojave Desert encompasses southeastern California and Nevada. Most destinations are readily accessible from Los Angeles or Las Vegas, using Interstates 10,15, and 40. 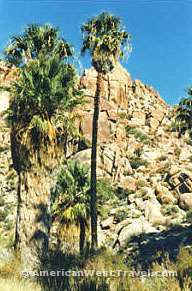 Joshua Tree is located off of Interstate 10 about 50 miles east of Palm Springs.